I shouldn't have read John Green's review. What can be said after John Green has already done it, better than you could ever dream? Can I just write what I put on my friend Amy's Facebook wall, "John Green loved it and you will, too"? This is the love story that you should hand to high school readers who want romance, but not Nicolas Sparks sap. This is real, against the odds romance, full of the difficulties that teenagers actually face. Eleanor's poor, redheaded, big, and has the worst stepfather. Park's the only half-Asian kid in Omaha, too effeminate for his father, and feels far too alternative for his small town. After a harsh start, the pair bond over music and comic books, slowly growing in their feelings for each other. The progression of their relationship feels realistic--although they spend all their time thinking about each other, they do little more than hold hands and memorize facial features. 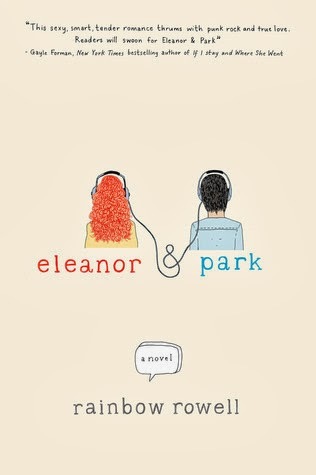 I loved the use of alternating narrators; we get Park's appreciation of the things that make Eleanor insecure. He thinks, "The whole sky was the color of her skin." She pines, "There's only one of him, she thought, and he's right here." Rainbow Rowell perfectly captures the all-consuming feeling of first love, while hinting at all the darkness that will cause it to fall apart. I don't want to spoil this book, it's just too good. Please read it, then hand it off to someone with whom you can discuss it.